If you want to know more in general about a foreign place, you want to ask a local. If you want to know more about the culture and history of a foreign place, you want to ask a local expert. Travel in Taiwan recently did just this, paying local historian Zhuang Yong-ming a visit to learn more about one of Taipei City’s oldest districts, Dadaocheng, before going on an exploration tour of the area. Zhuang Yong-ming (莊永明) was born and grew up in Dadaocheng (大稻埕) in the 1940s, and has been publishing books on Taiwanese history since the ’80s. 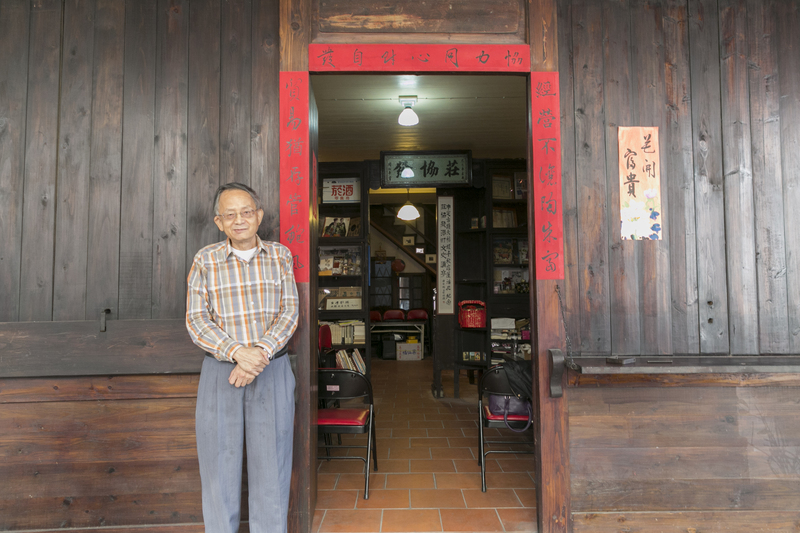 Now, with more than fifty books to his name, including the detailed guide Wandering Dadaocheng (大稻埕逍遙遊), he frequently lectures on the history of early Taipei and takes groups on cultural tours of his natal district. “As a child I would listen to my parents telling stories about the area and its history,” he says. “Later, I realized these stories weren’t anywhere in the textbooks, so I felt that it fell upon me to record them, to make sure they weren’t forgotten.” Armed with Mr. Zhuang’s book and a few pointers from the man himself, we take to the streets of Dadaocheng in search of Taipei’s past. Dadaocheng’s tea-export industry was launched in the latter half of the 19th century, after Taiwan was opened up to Western trade following the Second Opium War (1856-1860). 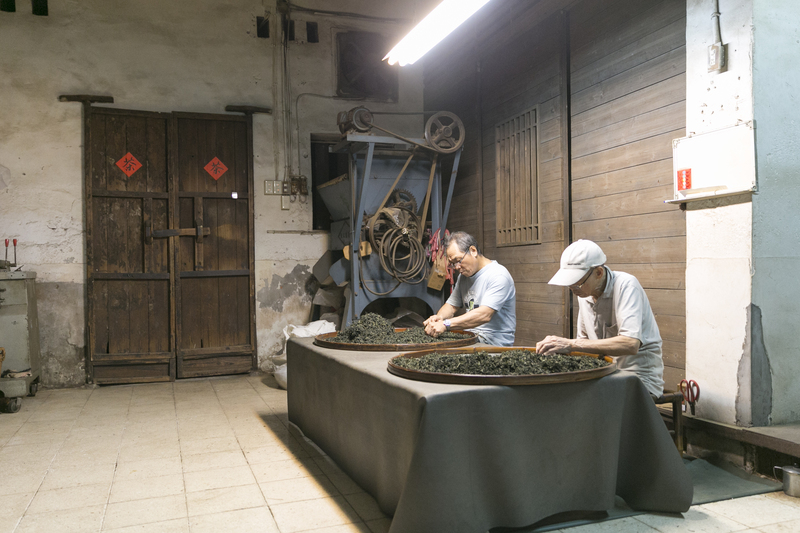 In 1869, an English businessman named John Dodd arrived in Taipei to establish a tea-export business, and Dadaocheng became the base of his operations. Other nations decided to get in on the game, and before long, companies from Denmark, Italy, Germany, and the United States – as well as others from Britain – all had their headquarters on Guide Street. Today, the old tea companies have disappeared, but you can still get a feel for the street’s tea-trade heyday from one striking building – the Chen Tian-lai Residence (Jin-Ji Tea Co.; 陳天來故居/錦記茶行) – at the north end of the street. 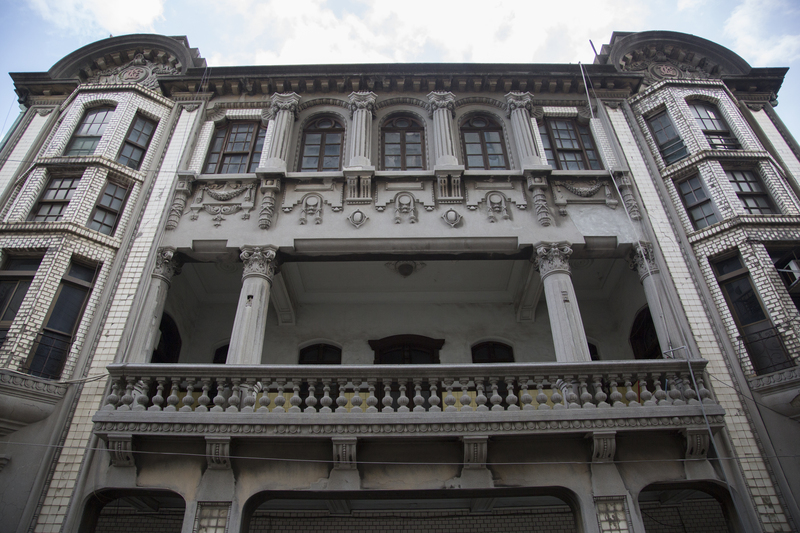 This three-story European-style building, with its striking portico and balconies, was built in 1923 and belonged to Mr. Chen Tian-lai, a tea tycoon. His tea company operated out of the arcade-fronted first floor. The residence also holds the enviable title of being the first in Taiwan to have a flushing toilet. 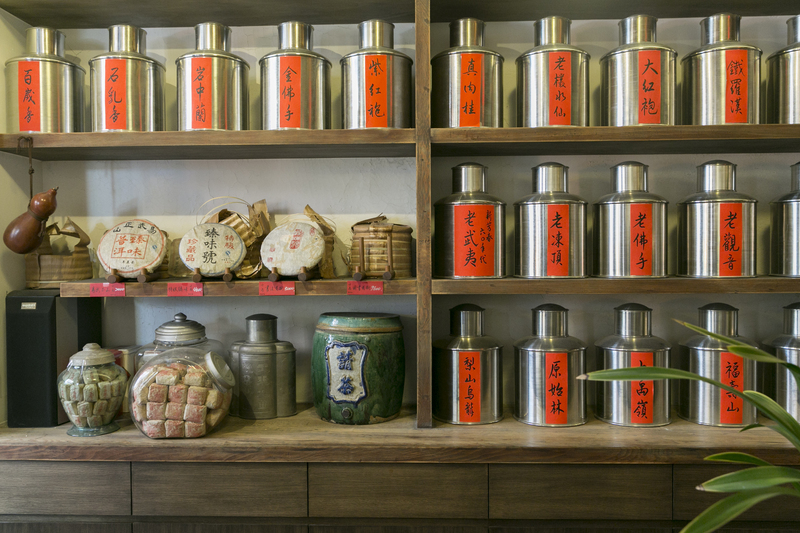 No more tea is traded here, but you can visit some of Dadaocheng’s historic tea shops – Wang’s Tea (王有記名茶) on Chongqing N. Road (also a tea-education center), and Zhenwei Teahouse (臻味茶苑) on Dihua Street – to slake your thirst for local tea and history both. On the left as you exit Guide Street at its north end is Dadaocheng Wharf (大稻埕碼頭), arguably the most important place in Dadaocheng in light of the site’s role in making the area the trade capital of the north in the late 19th and early 20th centuries. 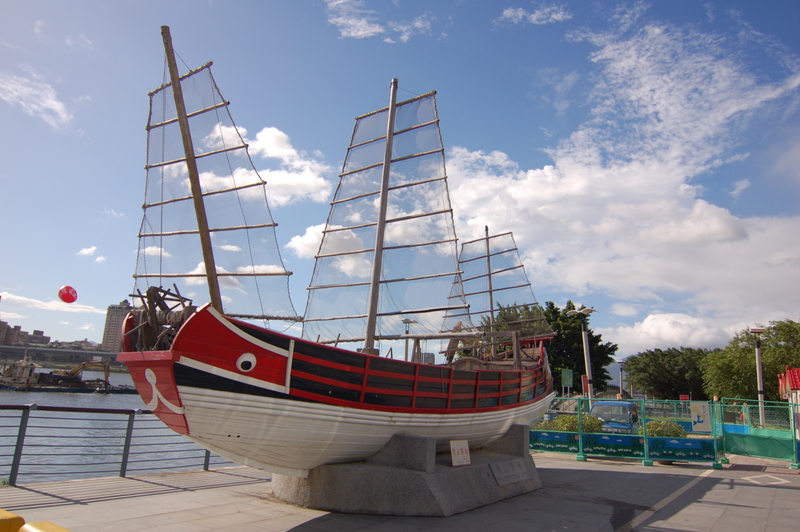 In the early 1800s Bangka (艋舺), on the Tamsui River to the south of Dadaocheng, was the economic center of the Taipei Basin. (“Bangka” is Taiwanese; the modern Mandarin Chinese name is Wanhua). In 1853, however, a conflict between different groups of Fujianese immigrants over land and religion (known as the Dingxiajiao Conflict) saw a large group relocate from Bangka to Dadaocheng. At the time Dadaocheng was little more than farmland, but with the combination of the population influx from the Dingxiajiao Conflict, the opening of the port of Tamsui to foreign trade in the 1860s, and the silting up of the river around the Bangka area, Dadaocheng overtook Bangka as the access point to the Taipei Basin from the coast. By 1898 the population of Dadaocheng was second only to the island’s long-time capital, Tainan in southern Taiwan. 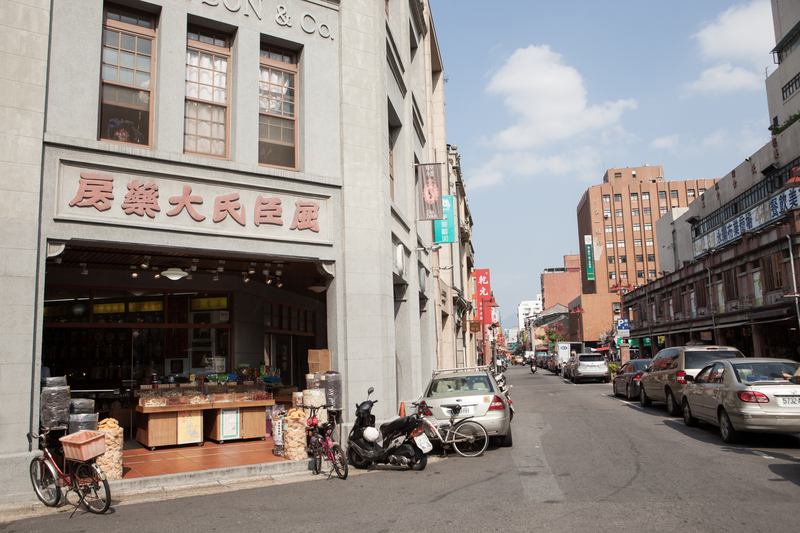 As a result of the international trade facilitated by the wharf facilities, Dadaocheng was the first place in Taipei to truly feel a foreign influence – an influence which can still be seen today in the West-meets-East architecture of the commercial establishments on its historic streets. 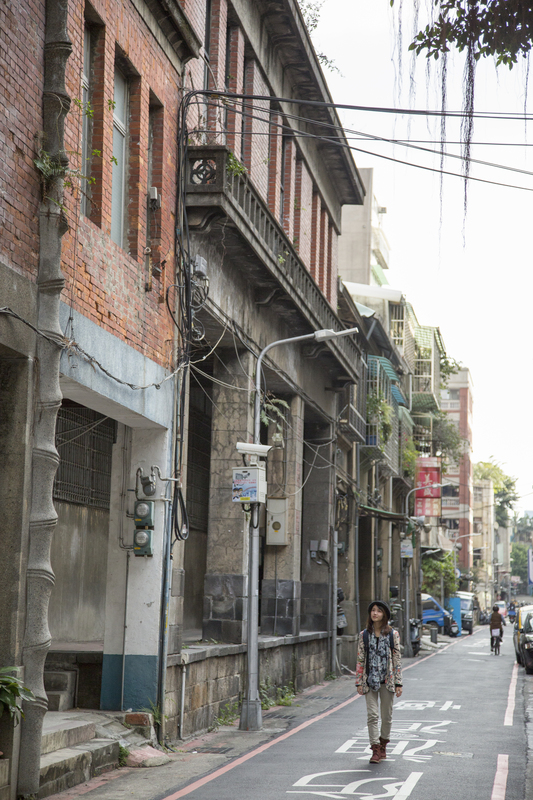 From the wharf, it’s a short walk along Minsheng West Road to Dihua Street – the oldest street in Dadaocheng. 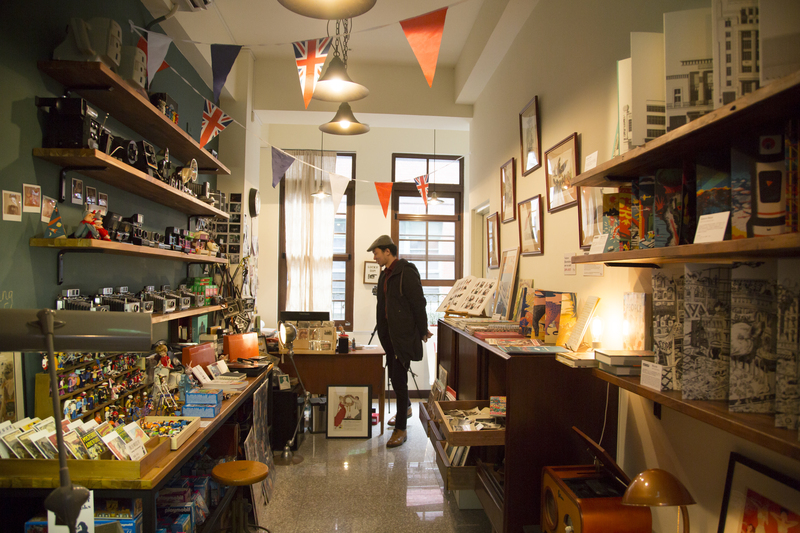 Walking the street, Mr. Zhuang says, is like walking through a dream of old Taipei. The foreign influence on Dadaocheng’s glory years is certainly evident here, with the buildings a palimpsest of the Fujianese, European Baroque and Classical, and Japanese Colonial styles. 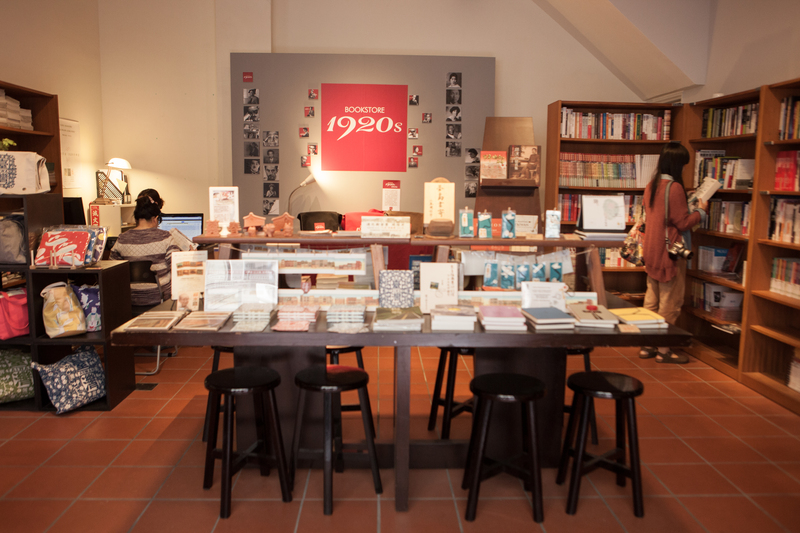 But behind Dihua Street’s nostalgic facades lies modern innovation. In recent years, significant urban regeneration projects have made use of old buildings that would otherwise have fallen into disrepair, and have appropriated them for use by young creative types. Across from the market is one of these: ArtYard1 (小藝埕). Housed in an old pharmacy building abandoned after a fire, the building now houses a vintage bookstore, a trendy coffee shop, and a ceramics boutique. 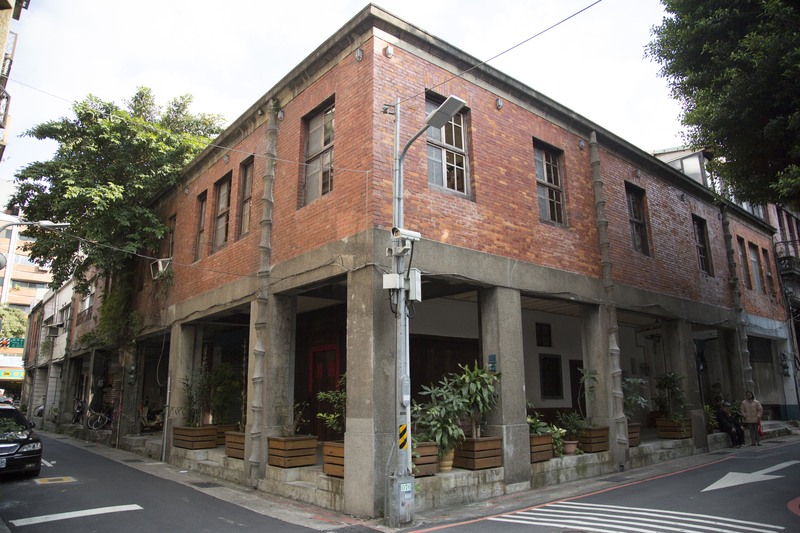 The ArtYard project also has several other converted buildings in the area – ArtYard67 (民藝埕) and ArtYard Academia (學藝埕), both further north on Dihua Street, and ArtYard2022 (眾藝埕) on nearby Minle Street – which house antique parlors, art galleries, leather vendors, handicraft stores, curiosity shops, and other fruits of the cultural-creative industry. These artsy boutiques aside, Dihua Street is chockablock with apothecaries supplying the ingredients used in traditional Chinese medicine, and the arcades are heavy with the odor of ginseng, jujubes, goji berries (wolfberries), and various other exotic roots, fungi, etc. Around Chinese New Year the street also becomes a huge purveyor of New Year’s decorations. Come or avoid, depending on your fondness for crowds. 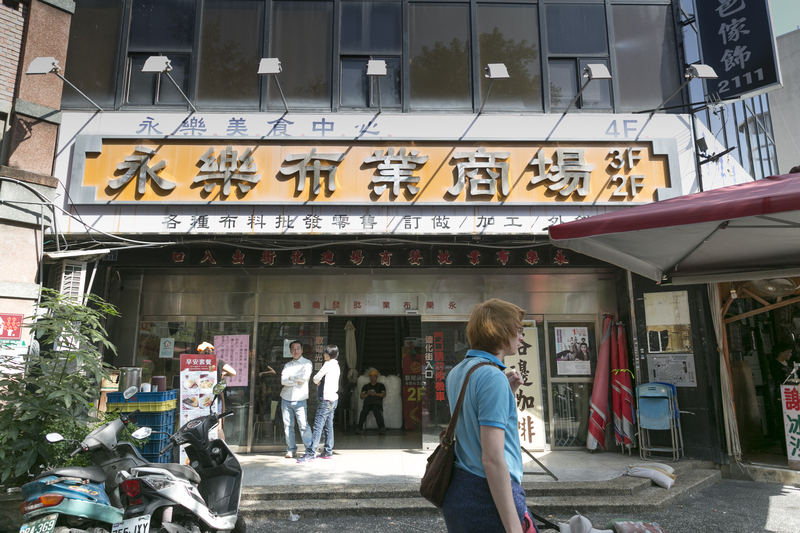 Just across from ArtYard1 is the rather austere edifice that is home to Yongle Market (永樂市場). The original market was established in 1896, though the current building is much newer. 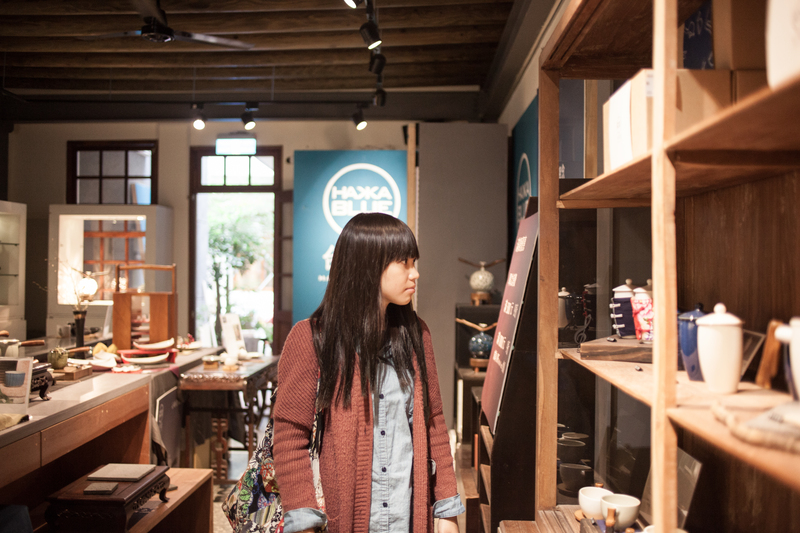 During the Japanese colonial era (1895~1945), there were close to a hundred fabric merchants in the market. Homage is paid to that fact on the 2nd and 3rd floors of the modern-day building with the housing of a fabric emporium – that caters to enterprising housewives and fashion designers alike. Everything from delicate Hakka flower prints to gaudy neon textiles – all are available here, and make for good browsing, even if you’re not particularly adept with a sewing machine. 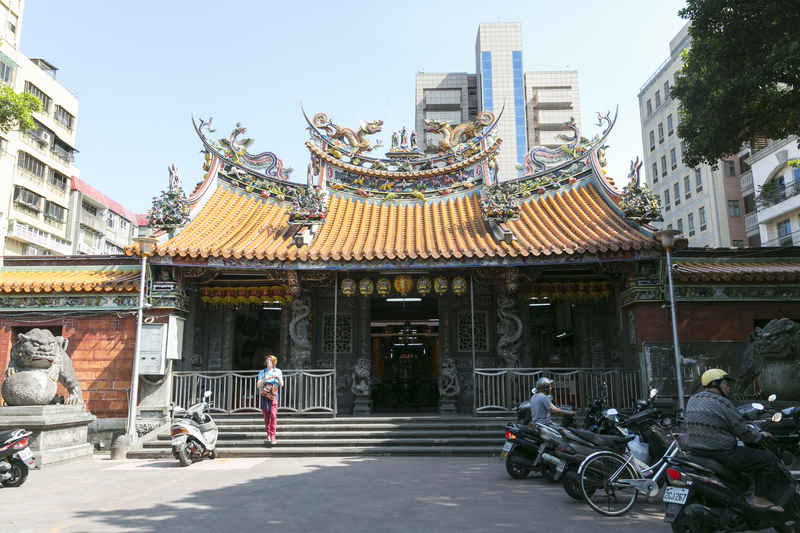 The main temple in Dadaocheng, the Xiahai City God Temple (霞海城隍廟), is also located on Dihua Street. The venerated main deity was originally the protector deity of Xiacheng in Tong’an County, Fujian Province, mainland China. In the early 1800s, immigrants from Tong’an brought the god’s effigy to Taiwan’s Bangka settlement. In 1853, when the Dingxiajiao Conflict broke out, a large group of Tong’an immigrants fled the area, taking their City God with them to Dadaocheng. Thirty-eight people lost their lives in protecting the statue during the escape, and these martyrs are now worshipped in the temple as the “Brave Guards,” who are said to keep away evil spirits. The temple, completed in 1859, in fact houses around 600 deities altogether, including the City God, his two lieutenants, his wife, a rather conspicuous Laughing Buddha, and several gods connected with the Chinese underworld. The deity that draws most visitors, however, is undoubtedly the Old Man under the Moon – the Chinese matchmaker god. These days, many singles will visit the temple to pray to the matchmaker, receiving one of his red strings as a good-luck charm. It is said that one’s true love is attached to the other end of this red thread, and that a blessing from the matchmaker will help find him or her. Another of Dadaocheng’s temples worth visiting is Cisheng Temple (慈聖宮), which is dedicated to Mazu, Goddess of the Sea. The temple as it currently stands was built in 1916, and Mr. Zhuang calls it architecturally the most magnificent of Dadaocheng’s temples. Visitors will probably be equally impressed by the amount of food on offer in the temple’s courtyard. More than 40 stalls sell street food there throughout the morning and afternoon, and it’s not unusual to see people relaxing under the nearby banyan tree, drinking beer or tucking into a tasty snack treat at one of the many tables. 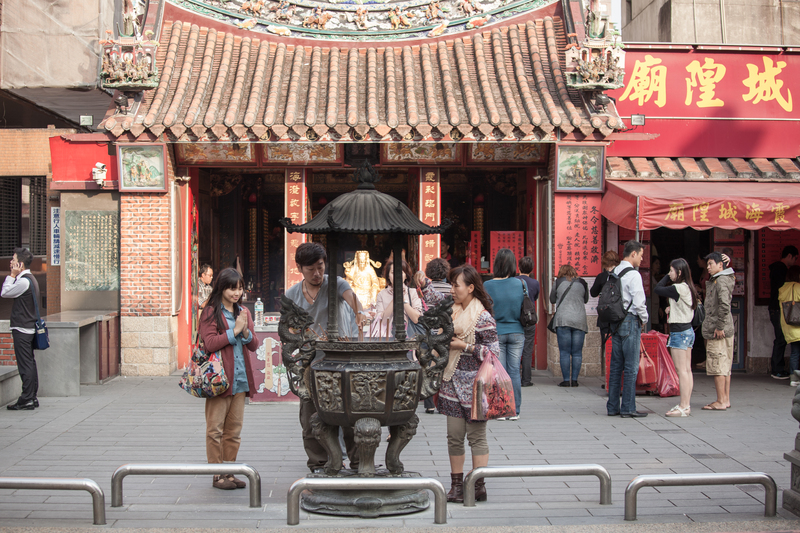 Visit Taipei’s Dadaocheng area by joining our Vintage Taipei Tour. Fruit Tourism is Taiwan’s Ripe New Trend! Breakfast in Taipei: Start Your Day Like a Local!